RF-IDeas pcProx Plus 82 Series card readers are designed for customers seeking to leverage their existing employee ID badges by integrating them into applications beyond physical security. 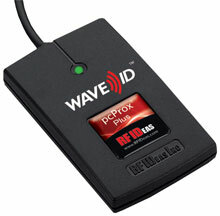 The reader possesses the capabilities of reading both 125 kHz proximity cards and 13.56 MHz contactless cards. With this dual-frequency multi-technology, the pcProx Plus 82 Series is highly configurable and capable of simultaneously handling any two of the available technologies. The pcProx Plus 82 Series readers integrate into your software or hardware product through the use of the RF IDeas Universal Software Developers Kit (SDK). In contrast to the Enroll readers, the 82 Series uses a callable DLL or other direct integration methods rather than keystroking (emulating a keyboard device). These low cost readers deliver the card ID in a format that applications recognize, offering nearly limitless possibilities for user identification and authentication.